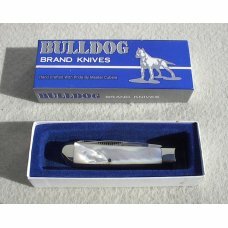 Bulldog Brand knives are high quality affordable knives. Most are imports from Germany, but a few are USA manufactured. The brand originated in 1978 through the efforts of a gentleman named Charlie Dorton. 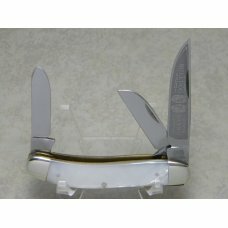 He built a great foundation by bringing extremely high quality knives to market from the Friedrich Olbertz factory located in Solingen Germany. The brand's evolution is well documented and is generally segmented into generations. Each generation ushered in marked changes that greatly affect collector value. 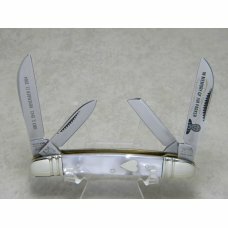 The brand is currently owned by Parker's Knife Collector's Service (PKCS) and knives are no longer made in large quantities. 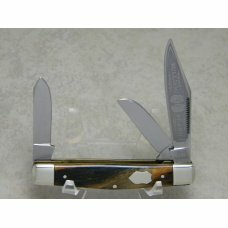 Great Eastern Cutlery (GEC) has made some fairly recent examples on contract for PKCS using GEC tooling & manufacturing processes. 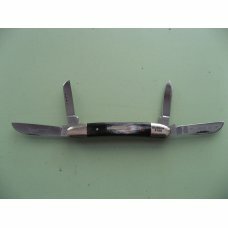 Most of the knives you will find for sale here will be new old stock or older collectible patterns from past generations. 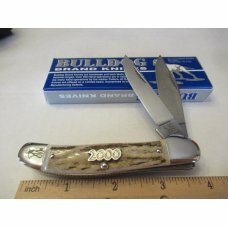 1983 Bulldog (double dog) Moose pattern. Never used, carried or sharpened. It has nice stag handles that are chip and crack free with the diamond sh..
Bulldog Brand Germany Stag "1997 Old Dominion Knife Collectors Association" Large Anglo Saxon Whittler Knife - 1 of 100 - Serial # 51 - Beautiful Genu..
Bulldog Brand Germany Stag "1986 Old Dominion Knife Collectors Association" 3 Blade Canoe Knife - 1 of 225 - Serial # 070 - Beautiful Genuine Stag Han..
Bulldog Brand Germany Stag "1984 Old Dominion Knife Collectors Association" Large Congress Knife - 1 of 300 - Serial # 034 - Beautiful Genuine Stag Ha..
Bulldog Brand Germany Stag "1983 Old Dominion Knife Collectors Association" Folding Hunter Knife - 1 of 300 - Serial # 046 - Beautiful Genuine Stag Ha..
Bulldog Brand Germany Stag "1981 Old Dominion Knife Collectors Association" Trapper Knife - 1 of 300 - Serial # 089 - Beautiful Genuine Stag Handles -..
Bulldog Brand Solingen Germany Genuine Stag 20 Year Anniversary 5 Blade Trapper Knife in Box c.1998 - 1 of only 300 made - Serial # 008 - Genuine Stag..
Bulldog Brand Germany 1995 Old Dominion Knife Collectors Assoc. 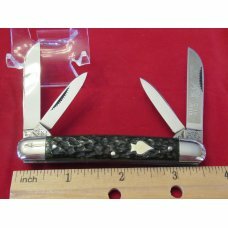 1 of 180 Whittler Knife - Serial # 119 - Beautiful Celluloid Handles - No Cracks - Nic..
Bulldog Brand Germany Old Dominion Knife Collectors Assoc. 1 of 100 Elephant Toe Knife - Serial # 80 - Beautiful Celluloid Handles - No Cracks - Nicke.. Here is a great 2006 Bulldog Brand HAND MADE Peanut PROTOTYPE! 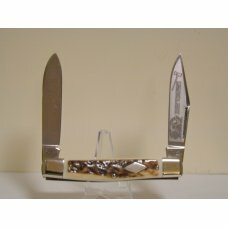 knife with FANTASTIC Heart ABALONE Handles +Original Box -RARE one! 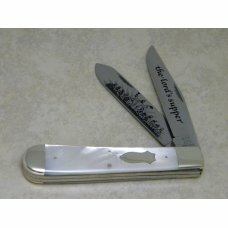 This beauty has the..
Bulldog Brand 1990's Beautiful AAA+ Mother of Pearl Mini Trapper knife. The Pearl Handles Have No Cracks or Chips. 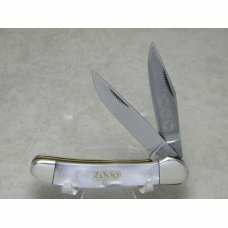 The Master Blade is Etched with ( B..
1996 Bulldog Brand (Hand Made) 2 Blade Pen Pocket Knife w Genuine Mother of Pearl Handles -NOS. It has great open/close snap and no blade wobble. It d..
PROTOTYPE! 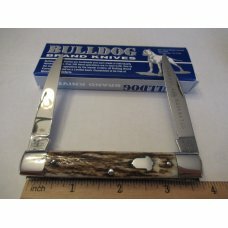 Bulldog Brand, Hand Made, Small ToothPick Pocket Knife with Fantastic Genuine Mammoth Bark Handles -NOS. 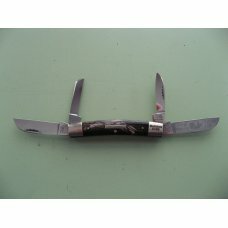 It has great open/close snap and n..
Bulldog Brand Germany 1999 Wolverine Knife Collectors Club Mastodon Ivory Elephant Toe Knife - Serial # 63 - Beautiful Genuine Mastodon Ivory Handles ..
Vintage 1993 HAND MADE Bulldog 3 Blade Sowbelly Stockman "Cuttin Horse" Knife with Flawless Mother of Pearl Handles -NOS. 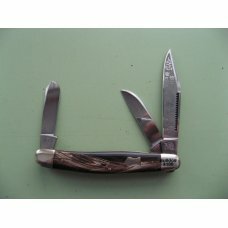 Low production run... No chi..
Bulldog Brand Made in Solngen, Germany Double Dogs Head Stag Congress Stag Handles with no chips or cracks Nickel Silver Bolsters ,Pins & Crest Shiel..
Bulldog Brand Surgical Instrument Stag handle Gunstock Stockman Surgical Inst.Stamped on all 3 blades No Wobble , No Half Stop. 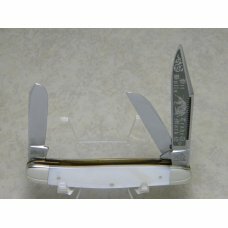 & Plenty of Snap Blad..
Vintage 1984 HAND MADE Bulldog 3 Blade Serpentine Stockman Kentucky Derby Knife with Great Stag Handles -NOS. Low production run... No chips or cracks..
2000 Bulldog Brand Stag Copperhead 1 of 60 made according to his book . New in Box never carried or sharpened . Made in Solingin Germany . Has the si.. Early Bulldog Stag Handle Trapper Hammer Forged Solingin Germany . New in Box never carried or sharpened . Nice Stag Handles with no chips or cracks .. Here is a FANTASTIC 2007, HAND MADE, Bulldog Brand Single Blade Barlow with Fantastic Deer Stag Handles, Blade Etchiing of fighting pitbulls and is in..
Vintage Bulldog Brand HAND MADE 2 Blade "Our Best - S & D" Tobacco Barlow w/ Green Pick Bone Handles in NM -NOS condition. No chips or cracks! Great h..
Bulldog Brand Hammer Forged Solingen Germany Genuine Mother of Pearl "Double Dog Head" Etch Sowbelly Stockman Knife - Beautiful Genuine Mother of Pear..
Bulldog Brand Hammer Forged Solingen Germany Genuine Mother of Pearl "Double Dog Head" Etch Stockman Knife - Beautiful Genuine Mother of Pearl Handles..
Bulldog Brand Hammer Forged Solingen Germany Genuine Mother of Pearl "Pit Bulls Trade Mark" Etch Premium Stockman Knife c.2004 - Beautiful Genuine Mot..
Bulldog Brand Hammer Forged Solingen Germany "the Lord's supper" Genuine Mother of Pearl Giant Trapper Knife c.1998 - Beautiful Genuine Mother of Pear..
Bulldog Brand Hammer Forged Solingen Germany "Anno Domini" 2000 Imitation Pearl Trapper Knife - Imitation Pearl Handles - No Cracks - Nickel Silver Bo..
Bulldog Brand Hammer Forged Solingen Germany "Anno Domini" 2000 Imitation Pearl Copperhead Knife - Imitation Pearl Handles - No Cracks - Nickel Silver..
Bulldog Brand Solingen Germany "In Memory of Jim Parker July 3, 1942 - November 17, 2004" Imitation Pearl Large Congress Knife c.2006 - Heart Shield -..
Bulldog Brand Solingen Germany "Cuttin Horse" Imitation Pearl Sowbelly Knife c.1993 - Spade Shield - 1 of only 36 made - Imitation Pearl Handles - No ..
Bulldog Brand Solingen Germany "No Etch" Gold Dust Series II Stockman Knife c.1995 - High Carbon Steel Blades - Round BD Shield - 1 of only 120 made -..
Bulldog Brand Solingen Germany "No Etch" Gold Dust Stockman Knife c.1994 - High Carbon Steel Blades - Crest Shield - 1 of only 120 made - Gold Dust Ce..
Bulldog Brand Germany Purple Swirl Congress Knife c.1995 - High Carbon Steel - No Etch - 1 of only 100 made - Round BD Shield - Purple Swirl Celluloid..
Bulldog Brand Germany Purple Swirl Stockman Knife c.1995 - High Carbon Steel - No Etch - 1 of only 100 made - Round BD Shield - Purple Swirl Celluloid..
Bulldog Brand Germany Abalone Swirl Hawbaker Muskrat Knife c.1995 (Series II) - High Carbon Steel - No Etch - 1 of only 100 made - Round BD Shield - A..
Bulldog Brand Germany Abalone Swirl Sowbelly Stockman Knife c.1993 - High Carbon Steel - No Etch - 1 of only 24 made - Acorn Shield - Abalone Swirl Ce..
Bulldog Brand Germany Abalone Swirl Stockman Knife c.1995 - High Carbon Steel - No Etch - 1 of only 100 made - Round BD Shield - Abalone Swirl Cellulo..
Bulldog Brand Germany Abalone Swirl Cattle Knife c.1995 - High Carbon Steel - No Etch - 1 of only 100 made - Round BD Shield - Abalone Swirl Celluloid..
Bulldog Brand Germany Abalone Swirl Cattle King Knife c.1993 - High Carbon Steel - No Etch - 1 of only 24 made - Bowtie Shield - Abalone Swirl Cellulo..
Bulldog Brand Germany Abalone Swirl "Lumber Jack" Etch Texas Jack Moose Knife c.1993 - 1 of only 100 made - Diamond Shield - Abalone Swirl Celluloid H..
Bulldog Brand Germany Abalone Swirl "Long Horn" Etch Large Toothpick Knife c.1993 - 1 of only 100 made - Bar Shield - Abalone Swirl Celluloid Handles ..
Bulldog Brand Germany Abalone Swirl "Anno Domini 2000" Etch Large Toothpick Knife c.2000 - 2000 Shield - Abalone Swirl Celluloid Handles - No Cracks -..
Bulldog Brand Germany Orange and Black Feathers Medium Stockman Knife - "Bulldog Brand" Etch - Federal Shield - Orange and Black Feathers Celluloid Ha..
Bulldog Brand Germany Orange and Black Feathers Large Stockman Knife - "Bulldog Brand" Etch - Federal Shield - Orange and Black Feathers Celluloid Han..
Bulldog Brand Germany Orange and Black Feathers 4 Blade Congress Knife - "Bulldog Brand" Etch - Federal Shield - Orange and Black Feathers Celluloid H..